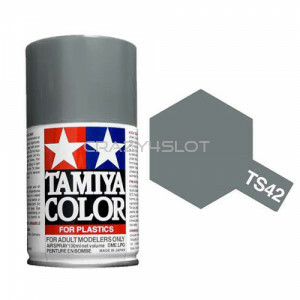 The Tamiya TS4 German Grey is a synthetic lacquer which can be used to paint plastic model kits. .. 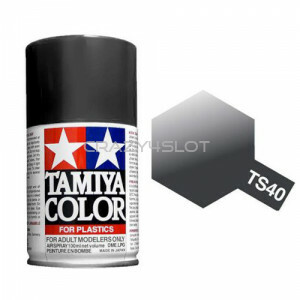 The Tamiya TS40 Met Black is a synthetic lacquer which can be used to paint plastic model kits. .. The Tamiya TS41 Coral Blue is a synthetic lacquer which can be used to paint plastic model kits. .. The Tamiya TS42 Light Gun Metal is a synthetic lacquer which can be used to paint plastic model ki.. The Tamiya TS44 Brilliant Blue is a synthetic lacquer which can be used to paint plastic model kit.. The Tamiya TS46 Light Sand is a synthetic lacquer which can be used to paint plastic model kits. .. The Tamiya TS47 Chrome Yellow is a synthetic lacquer which can be used to paint plastic model kit.. The Tamiya TS48 Gun Metal Grey is a synthetic lacquer which can be used to paint plastic model kit.. The Tamiya TS49 Bright Red is a synthetic lacquer which can be used to paint plastic model kits. .. The Tamiya TS5 Olive Drab is a synthetic lacquer which can be used to paint plastic model kits. .. The Tamiya TS50 Blue Mica is a synthetic lacquer which can be used to paint plastic model kits. .. The Tamiya TS51 Telefonica Blue is a synthetic lacquer which can be used to paint plastic model ki.. The Tamiya TS52 Candy Lime Green is a synthetic lacquer which can be used to paint plastic model .. The Tamiya TS53 Deep Metallic Blue is a synthetic lacquer which can be used to paint plastic model.. The Tamiya TS54 Light Metallic Blue is a synthetic lacquer which can be used to paint plastic mode.. The Tamiya TS55 Dark Blue is a synthetic lacquer which can be used to paint plastic model kits. .. The Tamiya TS56 Brilliant Orange is a synthetic lacquer which can be used to paint plastic model .. The Tamiya TS57 Blue Violet is a synthetic lacquer which can be used to paint plastic model kits. ..